India Women coach Maymol Rocky makes statement of intent ahead of 2020 Olympic qualifiers! 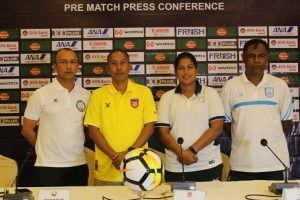 Home / International Football / Asia / India Women coach Maymol Rocky makes statement of intent ahead of 2020 Olympic qualifiers! The Indian women’s national team will be aiming to qualify for the second round of the 2020 AFC Women’s Olympic Qualifying Tournament for the first time in its history as it gets set to take on Nepal on Thursday, November 8 in their opening encounter in Group C.
After arriving in the Burmese capital of Yangon earlier, the team held its first training session at the Thuwunna Stadium on Wednesday, November 7 and at the pre-tournament press conference, coach Maymol Rocky made her side’s intentions very clear. Previous VIDEO – 442oons: Red Star Belgrade 2-0 Liverpool FC – Match Highlights (Parody)! Next Formula E & Ascot Racecourse to speak at iSportconnect’s Hospitality Masterclass!